MARY LEADBEATER was the postmistress of Ballitore village on the border of Kildare and Carlow in the heart of Ireland, and a birthright Quaker. She was the first girl pupil in the school run by her grandfather, Abraham Shackleton, in the village — a famous school, where Edmund Burke and Napper Tandy studied together, and Quaker parents from as far away as Norway, the Caribbean and France sent their sons to study. She is best remembered for her journal, published as Annals of Ballitore, which includes on-the-spot reportage of the horrors of the 1798 uprising of the United Irishmen and its suppression by the Anglo-Irish yeomanry, with the lynchings that followed. Mary also wrote several pamphlets — a popular pastime for well-got ladies of the time. 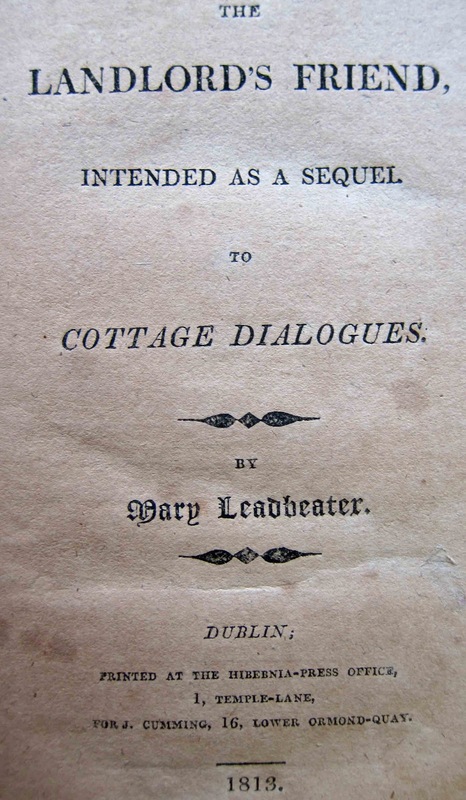 Her Cottage Dialogues are unusual in their approach, because Mary lived among her poor farmer neighbours, rather than seeing them from on high, and understood how it was possible, if difficult, for someone hungry and impoverished to claw the way into modest prosperity. 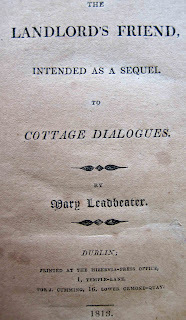 The Landlord's Friend consists of 20 dialogues, between two landlords — the Quakerly Squire Hartely and the more typically Anglo-Irish Squire Wilfort; and two landladies — the Quakerly Lady Seraphina and her ditsy friend Lady Charlotte; as well as Mrs Wilfort, and Lady Seraphina's tenants. In her earlier Cottage Dialogues, Mary had used the experience of her grandfather: Abraham Shackleton had been a poor English boy who gained an education through growing sallies and weaving baskets from them; by planting and selling his produce, seeds and plants; by working for anyone who would give him work, and finally by becoming first a monitor then a teacher in the small school where he was a pupil, until he was called to Ireland to open and run the new village school in Ballitore. By Mary's time the family were quietly well off. Squire Hartely: You cannot but have observed the lodging places of many of the poor. Squire Wilfort: I have, with disgust. I would scarcely lodge my hogs in such a manner, but I suppose they imagine that dirt keeps them warm. Lady Charlotte: Judy O'Flinn, why have not you had your window mended? Is not that your husband's sunday hat stopping the broken pane? Judy: Indeed, my Lady, I’ll not tell you a lie. It is Bill’s best hat, sure enough. We were laid out to get it mended these six weeks, and, I don’t know how it was, but we did not get it done. Thomas: We strove to divert ourselves with [our garden]; and I loved these little trees which he planted, and I cut off the straggling boughs, as he used to do, that they might grow up handsome. Ah! He was suddenly taken from us. Lady Charlotte: How old was your son? Thomas: Just the age of Kitty there. Three and twenty last Patrick’s day! Lady Charlotte: How is this? Did you not say they were of the same age? Thomas: Please, your Ladyship, our dear Henry was a nurse child from Dublin. We were paid very well for him the two first years, but after that we never heard of his father or mother, and we were often in dread that they would come and take him from us, and my poor woman often said she would beg the world with him, sooner than part with him. But now we are obliged to part with him. Lady Charlotte: What uncommon affection! Lady Seraphina: Not at all uncommon! There are many such proofs of the strong attachment of the Irish to the children committed to their care, and of the humanity and generosity of the Irish character. What effect The Landlord's Friend had on its audience is difficult to gauge. It was published in 1813, which is to say 15 years after the 1798 Rising — and 32 years before the outbreak of the Famine that cleared Ireland of millions of people, when landlords and merchants shipped out food crops and grew rich, while their tenants starved to death or, if they were lucky, emigrated to a country without landlords. Download The Landlord's Friend here: http://www.4shared.com/file/-3qQjw9Y/The_Landlords_Friend.html?